Will send an oppressor through the jewel of his kingdom - A tax collector. Oppressor (05065) (nagas) is a verb which means to force someone to do something, as in this context where it refers to forcing someone to pay money (cf 2Ki 23:35). Because of the rising power of Rome, he (Seleucus IV Philopator) was forced to pay tribute to the Romans of a thousand talents annually. In order to raise this large amount of money, Seleucus had to tax all the lands under his domain, including special taxes from the Jews secured by a tax collector named Heliodorus (2Macc 3:7) who took treasures from the temple at Jerusalem (Ed: But read the record from Second Maccabees). While they (Jews distraught that Heliodorus was attempting to take funds from God's House) were imploring the almighty Lord to keep the deposits safe and secure for those who had placed them in trust, Heliodorus went on with his plan. But just as he was approaching the treasury with his bodyguards, the Lord of spirits who holds all power manifested himself in so striking a way that those who had been bold enough to follow Heliodorus were panic-stricken at God’s power and fainted away in terror. There appeared to them a richly caparisoned horse, mounted by a dreadful rider. (Click picture below to enlarge) Charging furiously, the horse attacked Heliodorus with its front hoofs. The rider was seen to be wearing golden armor. Then two other young men, remarkably strong, strikingly beautiful, and splendidly attired, appeared before him. Standing on each side of him, they flogged him unceasingly until they had given him innumerable blows. Suddenly he fell to the ground, enveloped in great darkness. Men picked him up and laid him on a stretcher. The man who a moment before had entered that treasury with a great retinue and his whole bodyguard was carried away helpless, having clearly experienced the sovereign power of God. While he lay speechless and deprived of all hope of aid, due to an act of God’s power, the Jews praised the Lord who had marvelously glorified his holy Place; and the temple, charged so shortly before with fear and commotion, was filled with joy and gladness, now that the almighty Lord had manifested himself. Soon some of the companions of Heliodorus begged Onias to invoke the Most High, praying that the life of the man who was about to expire might be spared. Fearing that the king might think that Heliodorus had suffered some foul play at the hands of the Jews, the high priest offered a sacrifice for the man’s recovery. While the high priest was offering the sacrifice of atonement, the same young men in the same clothing again appeared and stood before Heliodorus. “Be very grateful to the high priest Onias,” they told him. “It is for his sake that the Lord has spared your life. Since you have been scourged by Heaven, proclaim to all men the majesty of God’s power.” When they had said this, they disappeared. After Heliodorus had offered a sacrifice to the Lord and made most solemn vows to him who had spared his life, he bade Onias farewell, and returned with his soldiers to the king. (2Macc 3:22-35) (Ed note: To be fair, the reader should be aware that there are no other records of these truly incredible events to definitively substantiate their authenticity). Seleucus IV Philopator was compelled by financial necessities, created in part by the heavy war-indemnity exacted by Rome (The Treaty of Apamea in 188BC stipulated that thousand talents were to be paid annually to the Roman government), to pursue an ambitious policy. In an effort to collect money to pay the Romans, he sent his minister Heliodorus to Jerusalem to seize (plunder) the temple treasury. On his return, Heliodorus assassinated Seleucus, and seized the throne for himself. The true heir Demetrius, son of Seleucus, was now being retained in Rome as a hostage, and the kingdom was seized by the younger brother of Seleucus, Antiochus IV Epiphanes (175-164BC). Antiochus managed to oust Heliodorus and an infant son of Seleucus, also named Antiochus, was formal head of state for a few years until Epiphanes had him murdered. Yet within a few days will be shattered, though not in anger nor in battle - Some scholars speculate that Heliodorus poisoned Seleucus IV Philopator in order to gain the throne. A despicable person - Antiochus IV Epiphanes (175-164BC) What a contrast is God's view (despicable) versus his narcissistic view (Epiphanes = shine upon ~ glorious one). Despicable (0959) (bazah) means to show contempt for someone or something, to view with disdain or to despise. Antiochus was indeed despised by the Jews. Bazah - 44x in 42v - Ge 25:34; Nu 15:31; 1Sa 2:30; 10:27; 15:9; 17:42; 2Sa 6:16; 12:9f; 2Kgs 19:21; 1Chr 15:29; 2Chr 36:16; Neh 2:19; Est1:17; 3:6; Ps 15:4; 22:6, 24; 51:17; 69:33; 73:20; 102:17; 119:141; Pr 14:2; 15:20; 19:16; Ec 9:16; Isa 37:22; 53:3; Jer 22:28; 49:15; Ezek 16:59; 17:16, 18f; 22:8; Da 11:21; Obad 1:2; Mal 1:6, 7, 12; 2:9. NAS = careless(1), contempt(1), despicable(1), despise(5), despised(32), despises(2), disdained(1), disdained*(1). Tranquility (07962) (salwah) means security, prosperity, lack of anxiety or concern. Salwah occurs 8x in 8v - Ps 122:7; Pr 1:32; 17:1; Jer 22:21; Ezek 16:49; Da 8:25; 11:21, 24. NAS = complacency(1), ease(2), prosperity(2), quietness(1), time of tranquility(2). Honor of kingship - Antiochus was not the rightful heir to the throne. Seize the kingdom by intrigue - Antiochus was a master of "political intrigue." was a cruel and violent persecutor of the Jews. See what decaying, perishing things worldly pomp and possessions are, and the power by which they are gotten. God, in His providence, sets up one, and pulls down another, as He pleases. This world is full of wars and fightings, which come from men's lusts. All changes and revolutions of states and kingdoms, and every event, are plainly and perfectly foreseen by God. No word of God shall fall to the ground; but what He has designed, what He has declared, shall infallibly come to pass. While the potsherds of the earth strive with each other, they prevail and are prevailed against, deceive and are deceived; but those who know God will trust in Him, and he will enable them to stand their ground, bear their cross, and maintain their conflict. NIV- Then an overwhelming army will be swept away before him; both it and a prince of the covenant will be destroyed. The overflowing forces will be flooded away before him - Describes the military victories of Antiochus IV Epiphanes over his enemies. Prince of the covenant - The identity of this individual is debated. Some commentaries favor this as reference to the "shattering" (murder) of the high priest Onias III who Antiochus Epiphanes ordered in 172BC. Others feel this represents Ptolemy VI Philometor who was defeated by Antiochus' forces. The high priest bore the title “prince of the covenant” because he was de facto the head of the theocracy at that time. In Da 11:28 and Da 11:32 the “covenant” is used for the Jewish state. Gain power with a small force of people - Antiochus the despicable deceiver allayed suspicion when he came against Egypt with a small force but was able to gain power over Egypt as far as Memphis. When the guardians of King Ptolemy VI Philometor of Egypt demanded the return of Coele-Syria in 170 BC, Antiochus launched a preemptive strike against Egypt, conquering all but Alexandria and capturing King Ptolemy. To avoid alarming Rome, Antiochus allowed Ptolemy VI to continue ruling as a Puppet-king. Upon Antiochus' withdrawal, the city of Alexandria chose a new King, one of Ptolemy's brothers, also named Ptolemy (VIII Euergetes). Instead of fighting a civil war, the Ptolemy brothers agreed to rule Egypt jointly. NLT - Without warning he will enter the richest areas of the land and do something that none of his predecessors ever did--distribute among his followers the plunder and wealth of the rich. He will plot the overthrow of strongholds, but this will last for only a short while. In a time of tranquility - When they felt they were secure. He will distribute plunder, booty, possessions among them - He used the treasures he gained from his victories to bribe and influence others to cooperate with him (cf 1Macc 3:30). Only for a time - This phrase reminds us that God is sovereign even over the events of evil men. God set the limits allotted to Antiochus Epiphanes. Schemes will be devised against him - There was treason against the King of the South. The idea is that a carefully calculated plan would be orchestrated against the King of the South. The text does not say but the same Hebrew word is used in Da 11:24 where it says Antiochus Epiphanes devises schemes against strongholds. As described in more detail below, Antiochus defeated the army of Ptolemy Philometor, and in the next campaign made himself master of all Egypt, except Alexandria. While they had frequent conferences at the same table, they spoke lies to each other; and the former returned to Syria laden with riches. The causes of this conflict are obscure. In 170, Eulaeus and Lenaeus, the two regents of the young king of Egypt Ptolemy VI Philometor, declared war on the Seleucid ruler Antiochus IV Epiphanes. In the same year, Ptolemy's younger siblings Ptolemy VIII Physcon and Cleopatra II were declared co-rulers in order to bolster the unity of Egypt. Military operations did not begin until 169 when Antiochus quickly gained the upper hand, seizing the important strategic town of Pelusium. The Egyptians realised their folly in starting the war, Eulaeus and Lenaeus were overthrown and replaced by two new regents, Comanus and Cineas, and envoys were sent to negotiate a peace treaty with Antiochus. Antiochus took Ptolemy VI (who was his nephew) under his guardianship, giving him effective control of Egypt. However, this was unacceptable to the people of Alexandria who responded by proclaiming Ptolemy Physcon as sole king. Antiochus besieged Alexandria but he was unable to cut communications to the city and he also needed to deal with a revolt in Judaea so, at the end of 169BC, he withdrew his army. Notice once more that the victory of Antiochus was to be credited to "devices." (schemes) Even those who worked closely with the king of the south, that is, men who ate at the king's table, turned against their ruler. We are not told how Antiochus successfully operated his conspiracy within the top administration in the Egyptian government, but we do know his wicked plan worked, at least for awhile. At the appointed time - The sovereign God is in control of time. He will return - Antiochus IV become angry when Ptolemy VI and his brother, Ptolemy Physcon were reconciled and invaded Egypt a second time. Will not turn out - Egypt's call for help from Rome resulted in dispatch of the Roman commander Gaius Popillius Laenas (described in the next verse as "ships of Kittim"), who confronted Antiochus IV, telling him to withdraw from Egypt or face the wrath of Rome. As described in Da 11:30 Antiochus withdrew in great anger which he avenged on the "Holy Covenant", the Jews. Ships of Kittim will come against him - This verse continues the story of Antiochus IV's unsuccessful second invasion of Egypt described in the previous passage. The ships of Kittim refer to the Roman forces that turned Antiochus IV away from his designs on Egypt. "Before you step out of that circle give me a reply to lay before the senate." "I will do what the senate thinks right." Not till then did Popilius extend his hand to the king as to a friend and ally. Antiochus evacuated Egypt at the appointed date, and the commissioners exerted their authority to establish a lasting concord between the brothers, as they had as yet hardly made peace with each other." Ab Urbe Condita, xlv.12. He will be disheartened and will return - Antiochus IV submits to the request of the Roman Senate not to invade Egypt again. Enraged (02194) (za'am) properly means to "foam at the mouth", and thus means to become angry, to express indignation (divine indignation - Ps 7:11, Isa 66:14, Zech 1:12, Mal 1:4). Given the root meaning (foaming at the mouth) it is not surprising that such anger can show in one's face (Pr 25:23). Za'am - 12x in 11v - Nu 23:7, 8; Ps 7:11; Pr 22:14; 24:24; 25:23; Isa 66:14; Da 11:30; Mic 6:10; Zech 1:12; Mal 1:4. NAS = abhor(1), angry(1), become enraged(1), been indignant(1), cursed(2), denounce(2), denounced(1), indignant(2), indignation(1). Show regard for those who forsake the holy covenant - Antiochus showed favor to those Jews who apostatized and locked arms with his agenda (which was clearly anti-Semitic). Forces (02220) (zerowa') is literally the arm, a physical part of the body, but is used repeatedly in the OT as a picture or symbol of might, power or strength. NAS = arm(53), arms(19), forces(3), help(1), mighty(1), position(1), power(4), shoulder(2), strength(8). Zerowa' - 92x in 85v - Ge 49:24; Ex 6:6; 15:16; Num 6:19; Deut 4:34; 5:15; 7:19; 9:29; 11:2; 18:3; 26:8; 33:20, 27; Jdg 15:14; 16:12; 1 Sam 2:31; 2 Sam 1:10; 22:35; 1Kgs 8:42; 2Kgs 9:24; 17:36; 2Chr 6:32; 32:8; Job 22:8f; 26:2; 35:9; 38:15; 40:9; Ps 10:15; 18:34; 37:17; 44:3; 71:18; 77:15; 79:11; 83:8; 89:10, 13, 21; 98:1; 136:12; Prov 31:17; Song 8:6; Isa 9:20; 17:5; 30:30; 33:2; 40:10f; 44:12; 48:14; 51:5, 9; 52:10; 53:1; 59:16; 62:8; 63:5, 12; Jer 17:5; 21:5; 27:5; 32:17, 21; 48:25; Ezek 4:7; 13:20; 17:9; 20:33f; 22:6; 30:21f, 24f; 31:17; Dan 10:6; 11:6, 15, 22, 31; Hos 7:15; 11:3; Zech 11:17. Sanctuary (04720) (miqdash) refers to the consecrated thing or place, especially the sanctuary, the Holy place, the hallowed part. Miqdash - 76x in 72v - Ex 15:17; 25:8; Lev 12:4; 16:33; 19:30; 20:3; 21:12, 23; 26:2, 31; Num 3:38; 10:21; 18:1, 29; 19:20; Josh 24:26; 1 Chr 22:19; 28:10; 2 Chr 20:8; 26:18; 29:21; 30:8; 36:17; Neh 10:39; Ps 68:35; 73:17; 74:7; 78:69; 96:6; Isa 8:14; 16:12; 60:13; 63:18; Jer 17:12; 51:51; Lam 1:10; 2:7, 20; Ezek 5:11; 7:24; 8:6; 9:6; 11:16; 21:2; 23:38f; 24:21; 25:3; 28:18; 37:26, 28; 43:21; 44:1, 5, 7ff, 11, 15f; 45:3f, 18; 47:12; 48:8, 10, 21; Dan 8:11; 9:17; 11:31; Amos 7:9, 13. NAS = holy(1), holy place(2), holy places(1), places(1), sacred part(1), sanctuaries(5), sanctuary(65). Fortress (04581) (mauz) refers to a place or means of safety or protection. Desecrate the sanctuary fortress - Literally - "the sanctuary, the fortress"
A bomination (08251) (shiqquts) is a very strong word referring to that which is filthy, detestable or abhorrent, disgusting (abominable filth). In the OT shiqquts was always used in connection with idolatrous practices, either referring to the idols themselves as being abhorrent and detestable in God's sight, or to something associated with the idolatrous ritual. Idols generally are referred to as an abomination (Jer 16:18; Ezek 5:11, Ezek 7:20). In one of the more incredible uses of this word in the OT we see the wisest man in the OT is described as "going after" the detestable idols (1Ki 11:5) and even building a high place for them (1Ki 11:7). Woe! Before you cast a stone read 1Cor 10:12! Shiqquts is translated in the Lxx most often with the noun bdelugma which means something that is extremely abhorred (an abomination, often associated with idolatry - Rev 17:4, cp Mt 24:15). Bdelugma is found only 6x in the NT (Mt 24:15, Mk 13:14, Lk 16:15, Rev 17:4, 5, 21:27) but over 100x in the Septuagint including 14x in Leviticus - Lev 5:2; Lev 7:21; 11:10, 12, 13, 20, 23, 41, 42; 18:22, 26, 27, 29; 20:13. Abomination of desolation - KJV has "the abomination that maketh desolate." While this abomination was fulfilled in 168BC, the abomination of Da 12:11-note refers to a yet future abomination of desolation which Jesus alluded to in Mt 24:15. Desolation (08074) (shamen/samen) means ruin or waste and is a primary root which refers to a desolation caused by some great disaster, usually a result of divine judgment and is used of people (2 Sam. 13:20; Lam. 1:13, 16) and places (Lev. 26:31, 32; Isa. 61:4; Ezek. 35:12). Lev 26:32 uses shamen/samen twice and conveys both of the ideas of this word the desolation and the reaction to the desolation = 'I will make the land desolate (shamen) so that your enemies who settle in it will be appalled (shamen) over it. Webster's English definition of desolate - Laid waste; in a ruinous condition; neglected; devoid of inhabitants and visitors; joyless, disconsolate, and sorrowful through or as if through separation from a loved one, showing the effects of abandonment and neglect; barren, lifeless (desolate landscape). Verb = to lay waste, to make wretched. Shamem - 86v - Usage in NAS = appalled(13), astonished(8), astounded(1), become desolate(1), causes horror(1), causing consternation(1), desolate(22), desolated(4), desolating(1), desolation(5), desolations(3), destitute(1), destroy(1), devastations(1), horrified(2), laid desolate(1), laid waste(4), lie deserted(1), lies desolate(1), made me desolate(1), made you desolate(1), made desolate(3), make the desolate(2), make their desolate(2), make them desolate(1), make your desolate(1), make… appalled(1), make… desolate(1), makes desolate(2), ravaged(1), ruin(1), ruined(1), ruins(1). Leviticus 26:22 (see context Lev 26:21 "seven times") 'I will let loose among you the beasts of the field, which will bereave you of your children and destroy your cattle and reduce your number so that your roads lie deserted. 31 'I will lay waste your cities as well and will make your sanctuaries desolate, and I will not smell your soothing aromas. 32 'I will make the land desolate so that your enemies who settle in it will be appalled over it. 34 ¶ 'Then the land will enjoy its sabbaths all the days of the desolation, while you are in your enemies' land; then the land will rest and enjoy its sabbaths. 35 'All the days of its desolation it will observe the rest which it did not observe on your sabbaths, while you were living on it. 43 'For the land will be abandoned by them, and will make up for its sabbaths while it is made desolate without them. They, meanwhile, will be making amends for their iniquity, because they rejected My ordinances and their soul abhorred My statutes. Numbers 21:30 "But we have cast them down, Heshbon is ruined as far as Dibon, Then we have laid waste even to Nophah, Which reaches to Medeba." 1 Samuel 5:6 Now the hand of the LORD was heavy on the Ashdodites, and He ravaged them and smote them with tumors, both Ashdod and its territories. 2 Samuel 13:20 Then Absalom her brother said to her, "Has Amnon your brother been with you? But now keep silent, my sister, he is your brother; do not take this matter to heart." So Tamar remained and was desolate in her brother Absalom's house. 2 Chronicles 36:21 to fulfill the word of the LORD by the mouth of Jeremiah, until the land had enjoyed its sabbaths. All the days of its desolation it kept sabbath until seventy years were complete. Ezra 9:3 ¶ When I heard about this matter, I tore my garment and my robe, and pulled some of the hair from my head and my beard, and sat down appalled. 4 Then everyone who trembled at the words of the God of Israel on account of the unfaithfulness of the exiles gathered to me, and I sat appalled until the evening offering. Job 16:7 "But now He has exhausted me; You have laid waste all my company. Job 17:8 "The upright will be appalled at this, And the innocent will stir up himself against the godless. Job 18:20 "Those in the west are appalled at his fate, And those in the east are seized with horror. Job 21:5 "Look at me, and be astonished, And put your hand over your mouth. Psalm 40:15 Let those be appalled because of their shame Who say to me, "Aha, aha!" Psalm 69:25 May their camp be desolate; May none dwell in their tents. Psalm 79:7 For they have devoured Jacob And laid waste his habitation. Psalm 143:4 Therefore my spirit is overwhelmed within me; My heart is appalled within me. Isaiah 33:8 The highways are desolate, the traveler has ceased, He has broken the covenant, he has despised the cities, He has no regard for man. 19 "For your waste and desolate places and your destroyed land-- Surely now you will be too cramped for the inhabitants, And those who swallowed you will be far away. Isaiah 52:14 Just as many were astonished at you, My people, So His appearance was marred more than any man And His form more than the sons of men. Isaiah 54:1 ¶ "Shout for joy, O barren one, you who have borne no child; Break forth into joyful shouting and cry aloud, you who have not travailed; For the sons of the desolate one will be more numerous Than the sons of the married woman," says the LORD. 3 "For you will spread abroad to the right and to the left. And your descendants will possess nations And will resettle the desolate cities. Isaiah 59:16 And He saw that there was no man, And was astonished that there was no one to intercede; Then His own arm brought salvation to Him, And His righteousness upheld Him. Isaiah 61:4 Then they will rebuild the ancient ruins, They will raise up the former devastations; And they will repair the ruined cities, The desolations of many generations. Isaiah 63:5 "I looked, and there was no one to help, And I was astonished and there was no one to uphold; So My own arm brought salvation to Me, And My wrath upheld Me. Jeremiah 2:12 "Be appalled, O heavens, at this, And shudder, be very desolate," declares the LORD. Jeremiah 4:9 ¶ "It shall come about in that day," declares the LORD, "that the heart of the king and the heart of the princes will fail; and the priests will be appalled and the prophets will be astounded." Jeremiah 10:25 Pour out Your wrath on the nations that do not know You And on the families that do not call Your name; For they have devoured Jacob; They have devoured him and consumed him And have laid waste his habitation. Jeremiah 12:11 "It has been made a desolation, Desolate, it mourns before Me; The whole land has been made desolate, Because no man lays it to heart. Jeremiah 18:16 To make their land a desolation, An object of perpetual hissing; Everyone who passes by it will be astonished And shake his head. Jeremiah 19:8 "I will also make this city a desolation and an object of hissing; everyone who passes by it will be astonished and hiss because of all its disasters. Jeremiah 49:17 "Edom will become an object of horror; everyone who passes by it will be horrified and will hiss at all its wounds. 20 Therefore hear the plan of the LORD which He has planned against Edom, and His purposes which He has purposed against the inhabitants of Teman: surely they will drag them off, even the little ones of the flock; surely He will make their pasture desolate because of them. Jeremiah 50:13 "Because of the indignation of the LORD she will not be inhabited, But she will be completely desolate; Everyone who passes by Babylon will be horrified And will hiss because of all her wounds. 45 Therefore hear the plan of the LORD which He has planned against Babylon, and His purposes which He has purposed against the land of the Chaldeans: surely they will drag them off, even the little ones of the flock; surely He will make their pasture desolate because of them. Lamentations 1:4 The roads of Zion are in mourning Because no one comes to the appointed feasts. All her gates are desolate; Her priests are groaning, Her virgins are afflicted, And she herself is bitter. Lamentations 3:11 He has turned aside my ways and torn me to pieces; He has made me desolate. Lamentations 4:5 Those who ate delicacies Are desolate in the streets; Those reared in purple Embrace ash pits. Lamentations 5:18 Because of Mount Zion which lies desolate, Foxes prowl in it. Ezekiel 3:15 Then I came to the exiles who lived beside the river Chebar at Tel-abib, and I sat there seven days where they were living, causing consternation among them. Ezekiel 4:17 because bread and water will be scarce; and they will be appalled with one another and waste away in their iniquity. Ezekiel 6:4 "So your altars will become desolate and your incense altars will be smashed; and I will make your slain fall in front of your idols. 6 "In all your dwellings, cities will become waste and the high places will be desolate, that your altars may become waste and desolate, your idols may be broken and brought to an end, your incense altars may be cut down, and your works may be blotted out. Ezekiel 26:16 "Then all the princes of the sea will go down from their thrones, remove their robes and strip off their embroidered garments. They will clothe themselves with trembling; they will sit on the ground, tremble every moment and be appalled at you. Ezekiel 27:35 'All the inhabitants of the coastlands Are appalled at you, And their kings are horribly afraid; They are troubled in countenance. Ezekiel 28:19 "All who know you among the peoples Are appalled at you; You have become terrified And you will cease to be forever."'" Ezekiel 29:12 "So I will make the land of Egypt a desolation in the midst of desolated lands. And her cities, in the midst of cities that are laid waste, will be desolate forty years; and I will scatter the Egyptians among the nations and disperse them among the lands." Ezekiel 30:7 "They will be desolate In the midst of the desolated lands; And her cities will be In the midst of the devastated cities. 12 "Moreover, I will make the Nile canals dry And sell the land into the hands of evil men. And I will make the land desolate And all that is in it, By the hand of strangers; I the LORD have spoken." 14 "I will make Pathros desolate, Set a fire in Zoan And execute judgments on Thebes. Ezekiel 32:10 "I will make many peoples appalled at you, and their kings will be horribly afraid of you when I brandish My sword before them; and they will tremble every moment, every man for his own life, on the day of your fall." 15 "When I make the land of Egypt a desolation, And the land is destitute of that which filled it, When I smite all those who live in it, Then they shall know that I am the LORD. Ezekiel 33:28 "I will make the land a desolation and a waste, and the pride of her power will cease; and the mountains of Israel will be desolate so that no one will pass through. Ezekiel 36:3 therefore prophesy and say, 'Thus says the Lord GOD, "For good reason they have made you desolate and crushed you from every side, that you would become a possession of the rest of the nations and you have been taken up in the talk and the whispering of the people."'" 34 "The desolate land will be cultivated instead of being a desolation in the sight of everyone who passes by. 36 "Then the nations that are left round about you will know that I, the LORD, have rebuilt the ruined places and planted that which was desolate; I, the LORD, have spoken and will do it." Daniel 8:13 Then I heard a holy one speaking, and another holy one said to that particular one who was speaking, "How long will the vision about the regular sacrifice apply, while the transgression causes horror, so as to allow both the holy place and the host to be trampled?" 27 Then I, Daniel, was exhausted and sick for days. Then I got up again and carried on the king's business; but I was astounded at the vision, and there was none to explain it. Daniel 9:18 "O my God, incline Your ear and hear! Open Your eyes and see our desolations and the city which is called by Your name; for we are not presenting our supplications before You on account of any merits of our own, but on account of Your great compassion. 27 "And he will make a firm covenant with the many for one week, but in the middle of the week he will put a stop to sacrifice and grain offering; and on the wing of abominations will come one who makes desolate, even until a complete destruction, one that is decreed, is poured out on the one who makes desolate." Daniel 11:31 "Forces from him will arise, desecrate the sanctuary fortress, and do away with the regular sacrifice. And they will set up the abomination of desolation. Daniel 12:11 "From the time that the regular sacrifice is abolished and the abomination of desolation is set up, there will be 1,290 days. Hosea 2:12 "I will destroy her vines and fig trees, Of which she said, 'These are my wages Which my lovers have given me.' And I will make them a forest, And the beasts of the field will devour them. Joel 1:17 The seeds shrivel under their clods; The storehouses are desolate, The barns are torn down, For the grain is dried up. Amos 7:9 "The high places of Isaac will be desolated And the sanctuaries of Israel laid waste. Then I will rise up against the house of Jeroboam with the sword." Amos 9:14 "Also I will restore the captivity of My people Israel, And they will rebuild the ruined cities and live in them; They will also plant vineyards and drink their wine, And make gardens and eat their fruit. Micah 6:13 "So also I will make you sick, striking you down, Desolating you because of your sins. Zephaniah 3:6 "I have cut off nations; Their corner towers are in ruins. I have made their streets desolate, With no one passing by; Their cities are laid waste, Without a man, without an inhabitant. Zechariah 7:14 "but I scattered them with a storm wind among all the nations whom they have not known. Thus the land is desolated behind them so that no one went back and forth, for they made the pleasant land desolate." Henry Morris adds "It is believed that Epiphanes, aided by traitorous Jews, sacrificed a sow on the altar and erected a statue of Zeus in the temple at Jerusalem. The motive behind this act was his ambition to unify the great empire extending all the way to India, left him by his father, by compelling all people in the empire to adopt the Greco/Roman system of culture and pantheistic religion." By smooth words - Antiochus IV Epiphanes was a "smooth operator" facile in using words laden with flattery. The root verb (for smooth) is balaq which means to be smooth or slippery! What a picture of this despicable king's speech and a foreshadowing of the future king, the Antichrist. Turn to godlessness those who act wickedly toward the covenant - This refers to Jews who are enticed by Antiochus to in essence "apostatize", to reject the truth of God's covenant. But - Observe the striking contrast between the Jews who were unfaithful and apostatized versus those Jews who remained faithful to Jehovah and His covenant. The people who know their God - This refers to faithful, God fearing Jews, who were "jealous" for God which in turn made them "zealous" (display strength and take action), for this verse alludes to the Maccabees who revolted against the forced imposition of godless religion upon the nation of Israel. Those (Jews) who have insight among the people (Jews) - This description refers to Jews who understood what was happening in Israel, because they knew and believed God's truth. As an aside, one wonders if some of the insight of these Jews was obtained from these prophecies of Daniel written over 250 years earlier. If so, these Jews would have had Biblical insight into the anti-Semitic acts of Antiochus IV Epiphanes. Give understanding to the many ( = the Jews) - Those who understood the truth instructed others in the truth of the Scriptures. The implication of this statement is these wise Jews appealed to their less knowledgeable Jewish brethren to place their hope in the covenant keeping God, Jehovah, and not in the anti-God teaching associated with paganism and Hellenization. Yet they will fall by sword and flame - The God fearing Jews who took a stand of God's Truth for the sake of righteousness paid dearly for their faith, suffering persecution and even death at the hands of the rabidly anti-Semitic king Antiochus. They will be granted a little help - This passage is somewhat difficult to interpret dogmatically but presumably refers to other Jews who came alongside the Maccabean rebels in their fight against Antiochus. Many will join them in hypocrisy - This appears to refer to Jews who will join with the Maccabean troops but who in actuality are only pretending loyalty. Some of those who have insight will fall - Some of the Jews who understood the significance of Antiochus' anti-Semitic actions would die (presumably in war with Antiochus' troops). The gracious design of such suffering was to sanctify them. Until the end time ("the time of the end" NIV, NLT, NET, ESV) - This time phrase signifies that the persecution of Israel will continue until the final period of time in the future, the time which God has appointed. This time will only come to an end, at the end of the "time of Jacob's trouble" (Jer 30:7 "but he will be saved from it" or rescued Da 12:1-note), the Great Tribulation (Mt 24:21), the last half of the Seventieth Week of Daniel. In other words, anti-Semitism and overt Jewish persecution will continue until the Messiah puts a stop to it at His Second Coming. The tragic History of the Jews bears out the veracity of this prediction, whether in the Spanish Inquisition (See The inquisition of the church against the Jews 1481-1834), the "Crusades" (see Persecution of Jews in the First Crusade)", the Pogroms, [meaning to destroy, wreak havoc or demolish violently] Hitler's Holocaust, etc. The approximately 135 specific prophecies in the first 35 verses of this chapter have been fulfilled with amazing accuracy, as would be expected of a divine revelation. There is every reason to believe, therefore, that the remaining proph­ecies of the chapter will have the same precise and literal fulfillment in the future. This prophecy applies entirely, as all expositors unanimously agree, to the Antichrist… That this Seleucid tyrant (Antiochus IV Epiphanes) and despoiler of the Jews is embraced in the description may be readily admitted; but the relation of Antiochus to "the king," upon whom the emphasis here falls, is no more than that of Cyrus to Christ, or that of the destruction by the Romans to the end of the world. The one is simply the typical forerunner of the other. Identity or the confinement of the portrait to Antiochus is never once to be thought of, unless we can arrange to transfer him down to the still-pending period of the resurrection of the dead (Ed note: Da 12:2-note continues the prophetic vision, chapter 12 being a poor chapter break), to which the time of this monster is so specifically assigned." Whoever this king may be, or from whatever quarter he may come, he is the last representative of the bestial world-power that ever bears rule upon earth. The terms of the angel's description, particularly as continued in the succeeding chapter, establish this beyond mistake. He is to "prosper till the indignation is accomplished" -- till God's angry visitations on the Jews for their sins are finally and fore ever exhausted and ended (Ed: cf the summary statements dealing with transgression, sin and iniquity in Da 9:24-note)--- which is manifestly not yet the fact. Then (See expressions of time) - When? At the appointed time (God's perfect timing which indicates His complete control of history), the time which is still to come. While not everyone agrees, as explained below, at this juncture it appears that Daniel describes events that take us into the future at "warp speed", so that between Daniel 11:35 and Daniel 11: 36, there is a gap of at least over 2160 years. Notice that if one carefully follows the pronouns describing the "king" in Da 11:36, this king proves to be the same one designated "him… him… he" in Daniel 11:40-note (which cannot be Antiochus because this verse says the King of the South comes against this other king - Antiochus cannot be both the "king of the north" and "him… him… he" in this verse!). Continuing this same line of reasoning, the king of Da 11:36 is the same "he" who will "come to his end" in Da 11:45-note, which in turn is clearly linked with the future "time of distress", rescue of the Jews in Daniel 12:1-note and resurrection in Daniel 12:2-note (none of which has yet occurred!). In sum, if one interprets Daniel 11:36-12:3 literally, the king of Daniel 11:36 is clearly not Antiochus IV Epiphanes but another king who has all the "pedigree" of the future Antichrist. Though not all have agreed, the evidence seems conclusive that the spotlight now falls on an evil ruler of the last days-Antichrist. (1) According to the angel's words, the scope of this prophecy was to include the "latter days" (Da 10:14-note). (2) In the opening verses of this section (Da 11:36, 37, 38, 39), introductory statements are made as if this person is being introduced in this context for the first time. This corresponds with the fact that the story of Antiochus in relation to the Jews was brought to completion (Da 11:35). (3) The prophecies (through Da 11:35) find fulfillment in history, but there is no historical correspondence with what now follows. (4) This king is actually distinguished from the king of the north (Da 11:40-note). Therefore, he cannot be Antiochus Epiphanes. (5) The entire section (Da 11:36-45) corresponds remarkably with other recognized prophecies of the final Antichrist (Da 7:24, 25, 26, 27; 8:23, 24, 25-note; Da 9:26-note, Da 9:27-note; 2Th 2:3, 4; Rev 13, 17). Remember that if God has perfectly fulfilled 135 prophecies from Daniel 11:1-35, the sure word of prophecy in these following verses Daniel 11:36 through Daniel 12:3 will be fulfilled just as perfectly! The king - Note that in contrast to the pattern in this chapter, this one is identified only as "the king" without qualifying him as from the North or the South (cf every previous mention of the king - Da 11:5, 6, 7, 8, 9, 11, 13, 14, 15, 25). The only previous use of king with geographic designation is in Da 11:3 where king refers to Alexander the Great who "will rule with great authority and do as he pleases" (Da 11:3-note) even as will the Antichrist. See also the discussion on Da 11:40. And so the king is a reference to the infamous Antichrist, the same individual that Daniel 9:26-note referred to as the "prince who is to come" who originates from the people who destroyed Jerusalem (the Romans). Will exalt himself above every god - This speaks of his self-deification (if he is above every god, the clear implication is that he considers himself to be a god! cf the root of all human sin in Ge 3:5). Will speak monstrous things against the God of gods - He blasphemes the true and living God. Indignation (02195) (za'am) literally means frothing at the mouth and speaks of fury and in the Scriptures is often a dramatic picture of God's great displeasure with sin (Isa 26:20; Isa 30:27; Hab 3:12). NAS = indignation(21), insolence(1). Za'am - 22 verses - Ps 38:3; 69:24; 78:49; 102:10; Isa 10:5, 25; 13:5; 26:20; 30:27; Jer 10:10; 15:17; 50:25; Lam 2:6; Ezek 21:31; 22:24, 31; Da 8:19; 11:36; Hos 7:16; Nah 1:6; Hab 3:12; Zeph 3:8. NAS = indignation(21), insolence(1). Indignation is defined as (extreme) anger (mingled with contempt, disgust, abhorrence) aroused by something unjust, unworthy, or mean. The 1828 Webster's defines indignation as "The anger of a superior; extreme anger; particularly, the wrath of God against sinful men for their ingratitude and rebellion. The effects of anger; the dreadful effects of God’s wrath; terrible judgments." Until the indignation is finished - "Until" is an expression of time which indicates that the Antichrist will prosper for a time but that his seemingly indomitable kingdom will come to an abrupt end when the indignation is finished. So what is the indignation? In the present context, the indignation speaks of God's wrath which will be poured out on the nation of Israel during the last 3.5 years of the Seventieth Week of Daniel, the Great Tribulation. For that which is decreed will be done - This phrase alludes to the sovereignty of God even over the time of this evil ruler and serves as a good reminder to all of us that God is in control, even when events and circumstances seem to us "out of control". For a complete destruction one that is decreed, the Lord God of hosts will execute in the midst of the whole land. Therefore thus says the Lord God of hosts, “O My people who dwell in Zion, do not fear the Assyrian who strikes you with the rod and lifts up his staff against you, the way Egypt did. For in a very little while My indignation (Heb = za'am = intense anger, curse) against you will be spent and My anger will be directed to their destruction. (Is 10:23, 24, 25). I agree with John MacArthur who comments: The indignation covers the entire period of Israel’s exile (Isa 26:20; Da 11:36). Here is the promise that it will end with the return of the Messiah (Isa 11:1, 2, 3, 4,5, 6-16). Show no regard - Antichrist although from a religious background (the specifics of which are debatable) will turn his back on his ancestral religion. The gods of the Seleucid ancestors of Antiochus IV were Apollo, the patron and ancestor of the dynasty, as well as Zeus. Walbank points out, however, that these special relationships did not, of course, deter the various royal houses from the worship of other gods and goddesses as well and from founding cults and temples to them… How do the benefactions of Antiochus contribute to an understanding of Da 11:37, 38? Many of his gifts to Greek cities were of a religious nature, and they benefited the cults of the gods of his fathers, mentioned above, for whom the text says the king showed no regard. In addition, these gifts to various cult centers demonstrate that to say Antiochus IV did not regard any god is inaccurate (Da 11:37). To be specific, he resumed the construction of the temple of Zeus in Athens. He also made contributions to the temple of Zeus in Olympia. He built a temple for Jupiter Capitolinus at Antioch. 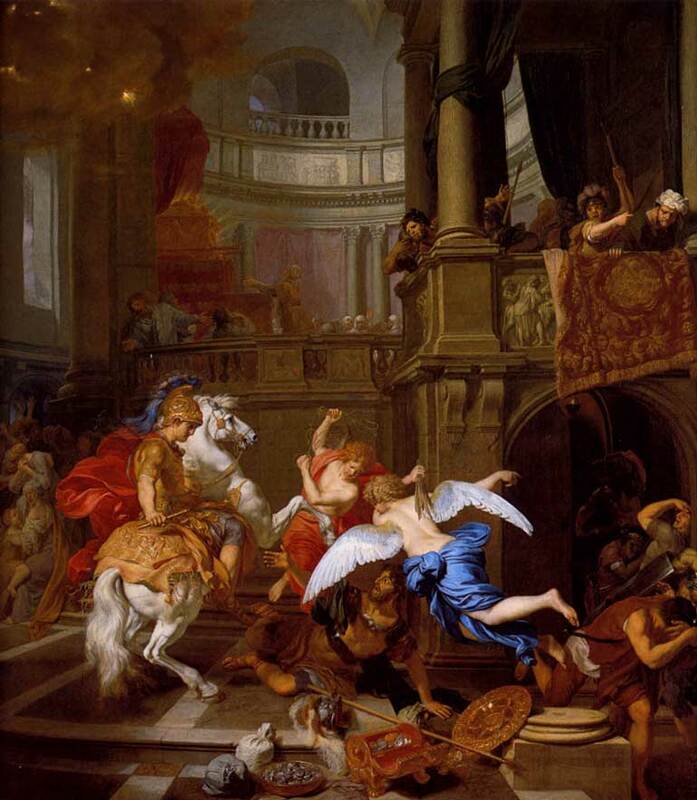 He contributed in some way to the building or rebuilding of the temple of Apollo at Daphne. The imposition of the edict of 167B.C. involved the introduction of the Dionysus cult. Finally, during the panyguric at Daphne in the summer of 166, a vast number of images were involved in the procession and following these games Apollo was honored with a new coinage of gold staters and tetradrachms. Antiochus also contributed some statues around the altar at Delos. Delos was thought to be the birthplace of Apollo and was considered sacred to him. Clearly this documentation of Antiochus IV's affection and support of numerous pagan deities, is strong support that this passage does not refer to that historical king as some posit (suggest), but to a future, yet to be revealed king. Most commentators feel this phrase signifies that the Antichrist simply rejects the religion practiced by his parents without specifying the religion. The desire of women - This phrase has also led some to favor a Jewish origin for the Antichrist because Jewish women often expressed the desire to be the mother of the Messiah (cf Hag 2:7KJV which uses "desire" to refer to Messiah). Certainly the Antichrist (anti = against or instead of) will show no regard for Christ (cf 1Jn 2:22) and will magnify himself above Christ. Some commentators interpret this phrase as signifying Antichrist has no desire for women (some even saying this suggests he is of homosexual orientation) and/or that he is virtually devoid of natural affection. Will magnify himself above them all (cf 2Th 2:3,4) - Ultimately the Antichrist will demand that all the earth’s inhabitants worship him above God or even so-called gods (Rev 13:12-note, Rev 13:14-note, Rev 13:15-note). But instead - Instead of the gods of his fathers. The god of fortresses is the personification of war, and the thought is this: he will regard no other god, but only war; the taking of fortresses he will make his god; and he will worship this god above all as the means of his gaining the world-power. His fathers - This phrase is used about 70x in Bible and almost every time refers to Jewish ancestral line. While one cannot be dogmatic as discussed above, this phrase could suggest that the Antichrist has a Jewish ancestry. This line of reasoning would also be consistent with the idea of "anti" = instead of. Thus the "counterfeit Christ" the one who is "instead of" the True Christ might logically be expected to be Jewish thus fulfilling OT prophecies that the Messiah (Christ) would be of this line. He will honor him - Antichrist will fortify the god of fortresses by providing a generous "budget" for a military arsenal, even as if it were an "offering" to this personified deity! That Antichrist honors a "god of fortresses" is seem by his continual engagement in war -- Da 11:40, 42, 43, 44, 45; Da 7:8, Da 7:24 Rev 13:4; Rev 16:13, 14, 15, 16). Foreign (05236) (nekar) means alien, strange, as of a deity that is not the true God (eg, Ge 35:2, Dt 32:12, of idols Jer 8:19). Nekar - 35x in 34v - Gen 17:12, 27; 35:2, 4; Ex 12:43; Lev 22:25; Dt 31:16; 32:12; Josh 24:20, 23; Jdg 10:16; 1Sa 7:3; 2Sa 22:45, 46; 2Chr 14:3; 33:15; Neh 9:2; 13:30; Ps 18:44, 45; 81:9; 137:4; 144:7, 11; Isa 56:3, 6; 61:5; 62:8; Jer 5:19; 8:19; Ezek 44:7, 9; Da 11:39; Mal 2:11. NAS = aliens (2), foreign(16), foreigner (6), foreigners (10), strange(1). The ultimate politicians, both Antiochus and Antichrist know how to manipulate people by rewards (make them rulers) and political payoffs (distribute the land at a price). At the time of the end - In context, this time phrase clearly conveys an eschatological (speaking of future things) meaning. If the angel intends to stay with his imagery from the beginning, the Antichrist may find himself battling Egypt and Syria. But one arriving at such a conclusion with any amount of dogmatism does so only to his or her peril. He will enter countries, overflow them and pass through - Like a flood flows through the land, this metaphor pictures his military might as overwhelming the enemies. As to who the "he" is in this passage, there is some disagreement, but the context would still seem to favor that this pronoun refers to the Antichrist. Beautiful land - This is the third of four references to beautiful land, the land of Israel - Da 8:9, 11:16, 11:41, 45. The reason it is beautiful (in my opinion) is because it is the birthplace of the Beautiful One and the future place of His reign as King of kings. He alone can make all things beautiful in His time! Beautiful (beauty, glory) (06643)(tsebi/tsebiy) is a masculine noun tsebi means "glory" (glorious) or "beauty" (beautiful) in the 18 uses in the NASB. Notice that the KJV has 32 uses and 14 not in the NASB have a distinctly different meaning than beauty referring to a gazelle or roebuck. Tsebiy describes Israel ("flowing with milk and honey which is the glory of all the lands" = Ezek 20:6, 15, Da 8:9, 11:16, 11:41, 45 = Temple Mount), the Messiah a Righteous Branch, a beautiful crown (Isa 4:2, Isa 24:16, Isa 28:5), the kingdom of Babylon (Isa 13:19), Ephraim (Isa 28:1). From these uses it is interesting to observe that tsebiy most often depicts the glory or beauty of a land or nation, but as noted also depicts the beauty of the Messiah! 2 Samuel 1:19 "Your beauty, O Israel, is slain on your high places! How have the mighty fallen! Isaiah 4:2 In that day the Branch of the LORD will be beautiful and glorious, and the fruit of the earth will be the pride and the adornment of the survivors of Israel. Isaiah 13:19 And Babylon, the beauty of kingdoms, the glory of the Chaldeans' pride, Will be as when God overthrew Sodom and Gomorrah. Isaiah 23:9 The LORD of hosts has planned it, to defile the pride of all beauty, To despise all the honored of the earth. Isaiah 24:16 From the ends of the earth we hear songs, "Glory to the Righteous One," But I say, "Woe to me! Woe to me! Alas for me! The treacherous deal treacherously, And the treacherous deal very treacherously." Isaiah 28:1 Woe to the proud crown of the drunkards of Ephraim, And to the fading flower of its glorious beauty, Which is at the head of the fertile valley Of those who are overcome with wine! 4 And the fading flower of its glorious beauty, Which is at the head of the fertile valley, Will be like the first-ripe fig prior to summer, Which one sees, And as soon as it is in his hand, He swallows it. Ezekiel 7:20 'They transformed the beauty of His ornaments into pride, and they made the images of their abominations and their detestable things with it; therefore I will make it an abhorrent thing to them. Ezekiel 20:6 on that day I swore to them, to bring them out from the land of Egypt into a land that I had selected for them, flowing with milk and honey, which is the glory of all lands. Daniel 8:9 Out of one of them came forth a rather small horn which grew exceedingly great toward the south, toward the east, and toward the Beautiful Land. Daniel 11:16 "But he who comes against him will do as he pleases, and no one will be able to withstand him; he will also stay for a time in the Beautiful Land, with destruction in his hand. 41 "He will also enter the Beautiful Land, and many countries will fall; but these will be rescued out of his hand: Edom, Moab and the foremost of the sons of Ammon. 45 "He will pitch the tents of his royal pavilion between the seas and the beautiful Holy Mountain; yet he will come to his end, and no one will help him. KJV - 32v KJV translates tsebiy as - roe 9, roebuck 5, glory 8, glorious 6, beautiful 1, beauty 1, goodly 1, pleasant 1; 32 - Deut 12:15, 22; 14:5; 15:22; 2 Sam 1:19; 2:18; 1 Kgs 4:23; 1 Chr 12:8; Prov 6:5; Song 2:7, 9, 17; 3:5; 8:14; Isa 4:2; 13:14, 19; 23:9; 24:16; 28:1, 4f; Jer 3:19; Ezek 7:20; 20:6, 15; 25:9; 26:20; Dan 8:9; 11:16, 41, 45. Why do I say the reference is not to the church? Because there are comments like those of Jeske who writes "In New Testament terms, the Holy Christian church is the “Beautiful Land” where the triune God resides with all his grace and his favor." (The People's Bible: Daniel). Edom, Moab… Ammon - These countries will be spared from the wrath of the Antichrist. Why? We cannot state with certainty therefore it is useless to speculate. Stretch out his hand against other countries - The hand is repeatedly used as a metaphor symbolizing power or might, indicating the Antichrist will wield his dominant power against countries such as Egypt. The land of Egypt - The fact that Egypt is specifically named suggests that this indeed refers to literal Egypt, which is not a powerful nation in our time but will achieve some degree of power in the future. He will gain control - The Antichrist will take valuable booty in the land of Egypt. While it is not possible to be dogmatic as to the timing of the event in Daniel 11:36-45, the events in this verse suggest it is almost surely the last half of the 7 years of Daniel's Seventieth Week, during which the Antichrist unveils his ''true colors''. He is indeed the "son of destruction" (2Th 2:3), a very destructive man even as foreshadowed by the despicable Antiochus IV Epiphanes. Rumors from the east and from the north will disturb him - The exact meaning of this phrase is uncertain. He will go forth with great wrath - While the Antichrist is dominating North Africa, he is made aware of these rumors which cause him to go back into the beautiful land in a state of great rage. Destroy (08045) (shamad) is a verb meaning "be destroyed, decimated, perished, overthrown, exterminated, i.e., pertaining to being in a totally ruined state, which can include death of a person or extinction of an entity." (Swanson) The destruction depicted by shamad usually involves a rather sudden catastrophe such as warfare or a mass killing. For example in Dt 6:15 God says He will "wipe" Israel off the face of the earth, so great was His anger against them! The Lxx has aphanizo (in Da 11:44) which means to cause to disappear, to make invisible or unrecognizable. What a vivid word picture of the effect of this Hebrew word shamad! Gilbrant - The Lord promised that if the Israelites did not obey his decrees and laws, He would "destroy your high places… make your cities waste" (Lev. 26:30f). When Israel was given their inheritance in Canaan, they were commanded by the Lord to "drive out all the inhabitants of the land from before you, and destroy all their [idols], and destroy all their molten images, and quite pluck down all their high places: And you shall dispossess the inhabitants of the land" (Num. 33:52f).The Hiphil forms sometimes refer to the destruction of human beings. The Israelites had murmured against Moses and complained against God that He had brought them out of Egypt to deliver them into the hands of the Amorites to destroy Israel (Deut. 1:27). Among the nations and lands which the Lord commanded Israel not to possess on their way to Canaan was Edom, or Mount Seir. In earlier times, that territory had been the possession of the Horites: "But the children of Esau succeeded them, when they had destroyed them… and dwelt in their stead," in land which they had received from the Lord (Dt 2:12, 22). The Ammonites similarly received land from the Lord, which had belonged to the Zamzummim, whom "the Lord destroyed" (cf. Dt 2:20f). The villages of Gaza had been taken from the Avvim, who were destroyed by the Caphtorim (Dt 2:23). The wicked minister of Persia, Haman, also sought to destroy the Jews, though God thwarted him through the courageous intercession of Esther (Est. 3:6). The infinitive is used as a substantive in the prophecies of Isaiah in reference to the fate of Babylon that the Lord would ultimately rise up against the city and would "sweep it with the besom of destruction" (Isa. 14:23). References to destruction of whole families and potential descendants are contained in the Hiphil forms. The house of Jeroboam I was cut off and exterminated because the king consecrated priests for the high places, where the pagans had worshiped idols, from any tribe of Israel, though Levi had been selected by God for such service (1Ki 13:33f). In En-Gedi, David spared the life of King Saul, though the king had been hunting him to kill him. A humbled and repentant Saul then extracted a promise from David that the young man who would one day be king would not exterminate in Israel the name of Saul or his descendants (1Sa 24:20f). The passive Niphal forms mean "to be laid waste," "to be exterminated," "to be destroyed." Land such as plains or fields can be destroyed, as was prophesied of Moab according to the word of the Lord to Jeremiah (Jer. 48:8). High places on hills were designated for destruction since worship of the sun and other idols occurred on them (Hos. 10:8). Israel promised not to make graven images or do evil by disobeying the ordinances of the Lord, lest they would be destroyed utterly by "cursing, vexation, and rebuke" sent from God because they had forsaken Him (Deut. 28:20; cf. Dt 4:26). Thus, whole peoples could experience destruction. Shamad - 86v - NAS Usage: completely(1), demolish(2), destroy(36), destroyed(41), destruction(2), eradicated(1), exterminate(2), totally destroy(1), utterly destroyed(1), wipe(1). Genesis 34:30 Then Jacob said to Simeon and Levi, "You have brought trouble on me by making me odious among the inhabitants of the land, among the Canaanites and the Perizzites; and my men being few in number, they will gather together against me and attack me and I will be destroyed, I and my household." Leviticus 26:30 'I then will destroy your high places, and cut down your incense altars, and heap your remains on the remains of your idols, for My soul shall abhor you. Deuteronomy 1:27 and you grumbled in your tents and said, 'Because the LORD hates us, He has brought us out of the land of Egypt to deliver us into the hand of the Amorites to destroy us. 22 just as He did for the sons of Esau, who live in Seir, when He destroyed the Horites from before them; they dispossessed them and settled in their place even to this day. Deuteronomy 4:3 "Your eyes have seen what the LORD has done in the case of Baal-peor, for all the men who followed Baal-peor, the LORD your God has destroyed them from among you. 26 I call heaven and earth to witness against you today, that you will surely perish quickly from the land where you are going over the Jordan to possess it. You shall not live long on it, but will be utterly destroyed. Deuteronomy 6:15 for the LORD your God in the midst of you is a jealous God; otherwise the anger of the LORD your God will be kindled against you, and He will wipe you off the face of the earth. Deuteronomy 7:4 "For they will turn your sons away from following Me to serve other gods; then the anger of the LORD will be kindled against you and He will quickly destroy you. 23 "But the LORD your God will deliver them before you, and will throw them into great confusion until they are destroyed. 24 "He will deliver their kings into your hand so that you will make their name perish from under heaven; no man will be able to stand before you until you have destroyed them. Deuteronomy 9:3 "Know therefore today that it is the LORD your God who is crossing over before you as a consuming fire. He will destroy them and He will subdue them before you, so that you may drive them out and destroy them quickly, just as the LORD has spoken to you. 8 "Even at Horeb you provoked the LORD to wrath, and the LORD was so angry with you that He would have destroyed you. 19 "For I was afraid of the anger and hot displeasure with which the LORD was wrathful against you in order to destroy you, but the LORD listened to me that time also. 20 "The LORD was angry enough with Aaron to destroy him; so I also prayed for Aaron at the same time. 25 "So I fell down before the LORD the forty days and nights, which I did because the LORD had said He would destroy you. Deuteronomy 28:20 "The LORD will send upon you curses, confusion, and rebuke, in all you undertake to do, until you are destroyed and until you perish quickly, on account of the evil of your deeds, because you have forsaken Me. 24 "The LORD will make the rain of your land powder and dust; from heaven it shall come down on you until you are destroyed. 45 "So all these curses shall come on you and pursue you and overtake you until you are destroyed, because you would not obey the LORD your God by keeping His commandments and His statutes which He commanded you. 48 therefore you shall serve your enemies whom the LORD will send against you, in hunger, in thirst, in nakedness, and in the lack of all things; and He will put an iron yoke on your neck until He has destroyed you. 51 "Moreover, it shall eat the offspring of your herd and the produce of your ground until you are destroyed, who also leaves you no grain, new wine, or oil, nor the increase of your herd or the young of your flock until they have caused you to perish. 61 "Also every sickness and every plague which, not written in the book of this law, the LORD will bring on you until you are destroyed. 63 "It shall come about that as the LORD delighted over you to prosper you, and multiply you, so the LORD will delight over you to make you perish and destroy you; and you will be torn from the land where you are entering to possess it. Deuteronomy 31:3 "It is the LORD your God who will cross ahead of you; He will destroy these nations before you, and you shall dispossess them. Joshua is the one who will cross ahead of you, just as the LORD has spoken. 4 "The LORD will do to them just as He did to Sihon and Og, the kings of the Amorites, and to their land, when He destroyed them. Joshua 7:12 "Therefore the sons of Israel cannot stand before their enemies; they turn their backs before their enemies, for they have become accursed. I will not be with you anymore unless you destroy the things under the ban from your midst. Joshua 9:24 So they answered Joshua and said, "Because it was certainly told your servants that the LORD your God had commanded His servant Moses to give you all the land, and to destroy all the inhabitants of the land before you; therefore we feared greatly for our lives because of you, and have done this thing. Joshua 11:14 All the spoil of these cities and the cattle, the sons of Israel took as their plunder; but they struck every man with the edge of the sword, until they had destroyed them. They left no one who breathed. 20 For it was of the LORD to harden their hearts, to meet Israel in battle in order that he might utterly destroy them, that they might receive no mercy, but that he might destroy them, just as the LORD had commanded Moses. Joshua 23:15 "It shall come about that just as all the good words which the LORD your God spoke to you have come upon you, so the LORD will bring upon you all the threats, until He has destroyed you from off this good land which the LORD your God has given you. Joshua 24:8 'Then I brought you into the land of the Amorites who lived beyond the Jordan, and they fought with you; and I gave them into your hand, and you took possession of their land when I destroyed them before you. Judges 21:16 Then the elders of the congregation said, "What shall we do for wives for those who are left, since the women are destroyed out of Benjamin?" 1 Samuel 24:21 "So now swear to me by the LORD that you will not cut off my descendants after me and that you will not destroy my name from my father's household." 2 Samuel 14:7 "Now behold, the whole family has risen against your maidservant, and they say, 'Hand over the one who struck his brother, that we may put him to death for the life of his brother whom he killed, and destroy the heir also.' Thus they will extinguish my coal which is left, so as to leave my husband neither name nor remnant on the face of the earth." 11 Then she said, "Please let the king remember the LORD your God, so that the avenger of blood will not continue to destroy, otherwise they will destroy my son." And he said, "As the LORD lives, not one hair of your son shall fall to the ground." 2 Samuel 22:38 "I pursued my enemies and destroyed them, And I did not turn back until they were consumed. 1 Kings 13:34 This event became sin to the house of Jeroboam, even to blot it out and destroy it from off the face of the earth. 2 Kings 10:17 When he came to Samaria, he killed all who remained to Ahab in Samaria, until he had destroyed him, according to the word of the LORD which He spoke to Elijah. 28 ¶ Thus Jehu eradicated Baal out of Israel. 2 Kings 21:9 But they did not listen, and Manasseh seduced them to do evil more than the nations whom the LORD destroyed before the sons of Israel. 1 Chronicles 5:25 But they acted treacherously against the God of their fathers and played the harlot after the gods of the peoples of the land, whom God had destroyed before them. 2 Chronicles 33:9 Thus Manasseh misled Judah and the inhabitants of Jerusalem to do more evil than the nations whom the LORD destroyed before the sons of Israel. Esther 3:6 But he disdained to lay hands on Mordecai alone, for they had told him who the people of Mordecai were; therefore Haman sought to destroy all the Jews, the people of Mordecai, who were throughout the whole kingdom of Ahasuerus. 13 Letters were sent by couriers to all the king's provinces to destroy, to kill and to annihilate all the Jews, both young and old, women and children, in one day, the thirteenth day of the twelfth month, which is the month Adar, and to seize their possessions as plunder. Esther 4:8 He also gave him a copy of the text of the edict which had been issued in Susa for their destruction, that he might show Esther and inform her, and to order her to go in to the king to implore his favor and to plead with him for her people. Psalm 37:38 But transgressors will be altogether destroyed; The posterity of the wicked will be cut off. Psalm 92:7 That when the wicked sprouted up like grass And all who did iniquity flourished, It was only that they might be destroyed forevermore. Psalm 106:23 Therefore He said that He would destroy them, Had not Moses His chosen one stood in the breach before Him, To turn away His wrath from destroying them. Psalm 145:20 The LORD keeps all who love Him, But all the wicked He will destroy. Isaiah 10:7 Yet it does not so intend, Nor does it plan so in its heart, But rather it is its purpose to destroy And to cut off many nations. Isaiah 13:9 Behold, the day of the LORD is coming, Cruel, with fury and burning anger, To make the land a desolation; And He will exterminate its sinners from it. Isaiah 14:23 "I will also make it a possession for the hedgehog and swamps of water, and I will sweep it with the broom of destruction," declares the LORD of hosts. Isaiah 23:11 He has stretched His hand out over the sea, He has made the kingdoms tremble; The LORD has given a command concerning Canaan to demolish its strongholds. Isaiah 26:14 The dead will not live, the departed spirits will not rise; Therefore You have punished and destroyed them, And You have wiped out all remembrance of them. Isaiah 48:19 "Your descendants would have been like the sand, And your offspring like its grains; Their name would never be cut off or destroyed from My presence." Jeremiah 48:8 "A destroyer will come to every city, So that no city will escape; The valley also will be ruined And the plateau will be destroyed, As the LORD has said. 42 "Moab will be destroyed from being a people Because he has become arrogant toward the LORD. Lamentations 3:66 You will pursue them in anger and destroy them From under the heavens of the LORD! Ezekiel 14:9 "But if the prophet is prevailed upon to speak a word, it is I, the LORD, who have prevailed upon that prophet, and I will stretch out My hand against him and destroy him from among My people Israel. Ezekiel 25:7 therefore, behold, I have stretched out My hand against you and I will give you for spoil to the nations. And I will cut you off from the peoples and make you perish from the lands; I will destroy you. Thus you will know that I am the LORD." Ezekiel 32:12 "By the swords of the mighty ones I will cause your hordes to fall; all of them are tyrants of the nations, And they will devastate the pride of Egypt, And all its hordes will be destroyed. Ezekiel 34:16 "I will seek the lost, bring back the scattered, bind up the broken and strengthen the sick; but the fat and the strong I will destroy. I will feed them with judgment. Daniel 11:44 "But rumors from the East and from the North will disturb him, and he will go forth with great wrath to destroy and annihilate many. Hosea 10:8 Also the high places of Aven, the sin of Israel, will be destroyed; Thorn and thistle will grow on their altars; Then they will say to the mountains, "Cover us!" And to the hills, "Fall on us!" Amos 2:9 "Yet it was I who destroyed the Amorite before them, Though his height was like the height of cedars And he was strong as the oaks; I even destroyed his fruit above and his root below. Amos 9:8 "Behold, the eyes of the Lord GOD are on the sinful kingdom, And I will destroy it from the face of the earth; Nevertheless, I will not totally destroy the house of Jacob," Declares the LORD. Micah 5:14 "I will root out your Asherim from among you And destroy your cities. Zechariah 12:9 "And in that day I will set about to destroy all the nations that come against Jerusalem. Annihilate (02763) (haram) means to completely destroy, to devote to destruction, to exterminate, to annihilate, to doom with the ultimate idea of bringing about a complete and utter destruction. Haram - 51x in 47v NAS = annihilate(1), covet(1), destroy them utterly(1), destroy utterly(1), destroyed them utterly(1), destroying(1), destroying them completely(2), destruction(2), devote(2), forfeited(1), set apart(1), sets apart(1), utterly destroy(11), utterly destroyed(22), utterly destroying(3). - Ex 22:20; Lev 27:28, 29; Nu 21:2, 3; Deut 2:34; 3:6; 7:2; 13:15; 20:17; Josh 2:10; 6:18, 21; 8:26; 10:1, 28, 35, 37, 39, 40; 11:11, 12, 20, 21; Jdg 1:17; 21:11; 1Sa 15:3, 8, 9, 15, 18, 20; 1Kgs 9:21; 2Kgs 19:11; 1Chr 4:41; 2Chr 20:23; 32:14; Ezra 10:8; Isa 11:15; 34:2; 37:11; Jer 25:9; 50:21, 26; 51:3; Da 11:44; Mic 4:13. Between the seas - the Dead Sea and the Mediterranean Sea. The beautiful mountain - Mount Moriah, the place of Temple Mount. Yet he will come to his end - This describes the demise of the Antichrist. And I saw the beast (the Antichrist) and the kings of the earth and their armies assembled to make war against Him who sat on the horse and against His army. And the beast (the Antichrist) was seized, and with him the false prophet (Beast #2, "another beast" of Revelation 13 - Re 13:11, 12, 13, 14-note) who performed the signs in his presence, by which he deceived those who had received the mark of the beast and those who worshiped his image; these two were thrown alive into the lake of fire which burns with brimstone. (Rev 19:19-note, Rev 19:20-note including discussion of the "Lake of Fire"). Daniel 11 has enormous theological value. Since no human being can know the future (apart from divine inspiration), there must be a God in heaven who revealed these matters. Second, the divine omniscience and omnipotence of the Lord is set forth. God foretells future events and therefore must have supreme knowledge and power over history. Third, for those who live after the predicted events have occurred, there is the confidence that since the previous prophecies have been fulfilled, the subsequent promises of deliverance and triumph will just as assuredly come true. Fourth, the fulfillment of these amazing predictions evidences that the Holy Scriptures are truly a product of supernatural revelation.